The DII softball season is one month old. While some familiar faces are already atop the leaderboard, some new players are breaking out. 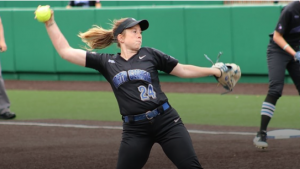 Let’s take a look at 7 pitchers dominating the circle thus far in DII softball. Leading things off is the DII softball leader in strikeouts. Demarest has struck out 121 batters in her 78.2 innings of work. She has the DII single-game high of 19 strikeouts she set on opening day, added an 18-strikeout performance in 11.1 innings Feb. 23 and became the Cougars all-time strikeout leader on March 5. Demarest broke out last season with 167 strikeouts in 156.1 innings, but she is on pace to shatter that. You can pick either Lipovsky or Hannah Beatus for the Lakers, both of whom are off to red-hot starts. Combined, they have allowed just 11 runs in 92.2 innings for a 0.83 team ERA. Lipovsky gets the nod over her rotation mate because she is a perfect 7-0 on the season. The senior righty has also been tough to even hit, striking out 71 in her first 48 innings of work. File this one under the, ‘Well, duh’ category. The junior righty has been one of the most dominant pitchers in DII softball since stepping in the circle, leading DII in wins (36), strikeouts (338), and ERA (0.59) last year. So far in 2019, it’s business as usual as Smith is 10-0 with a 0.41 ERA and 109 strikeouts through 67.2 innings. Freshman sighting. The Javelinas righty is on a list full of seasoned veterans, and she’s certainly playing like one. Castillo is 12-1 with a 1.59 EA, striking out 98 in 79 innings. That’s not just a strong way to start the season, but a hot start to a promising career. Fun name aside, Guitar earns her spot on this list jumping out to a 4-1 start on the year. All four of her starts have been complete games, and she’s struck out more than one per inning in each of them. Guitar also has one save on the year, meaning she’s been part of the decision in every one of her six appearances. Throw in a 6-for-12 start at the plate, and Guitar is doing just about everything to start off 2019. The senior righty had a nice debut with Rollins in 2018 but is breaking out in her final year. Summers is off to a 6-0 start with a save and has allowed just four runs through her first 45 innings pitched. She’s also striking out 11.36 per seven, well above her 5.78 mark from last year. Curry had 12 wins combined in her first two seasons in Kaneohe. She’s already surpassed that total in 2019, tied for second in DII softball with 10 wins. She won’t strikeout many, just 37 through 77.2 innings, but Curry also doesn’t allow runs to score, posting a 1.80 ERA and only allowing one home run this season.